The dugong is the only entirely marine mammal to feed exclusively on plants, a trait that leads to its other common name of 'sea cow'. 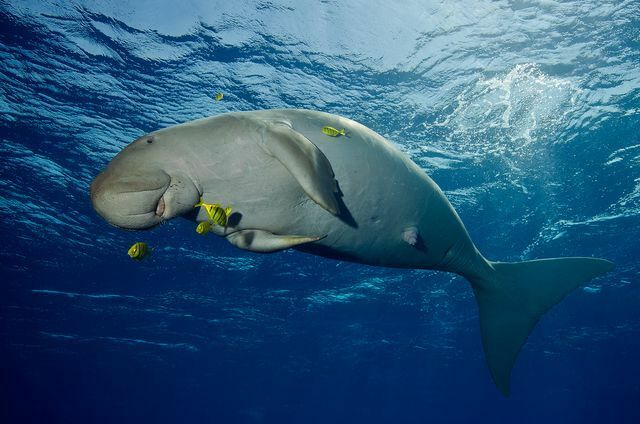 These large, rotund animals have short, paddle-like front flippers and a fluke-like tail, with a straight or concave edge, that is used for propulsion. The thick skin is a brownish-grey colour and there are short, coarse hairs sparsely distributed over the body but concentrated as bristles on the muzzle. All dugongs grow tusks but these only break the skin, and therefore become visible, in mature males. The large, rounded snout ends in a cleft, muscular upper lip that hangs over the down-turned mouth. A dugong reaches sexual maturity between the ages of eight and eighteen, older than in most other mammals. The way that females know how a male has reached sexual maturity is by the eruption of tusks in the male since tusks erupt in males when testosterone levels reach a high enough level. The age when a female first gives birth is disputed, with some studies placing the age between ten and seventeen years, while others place it as early as six years. 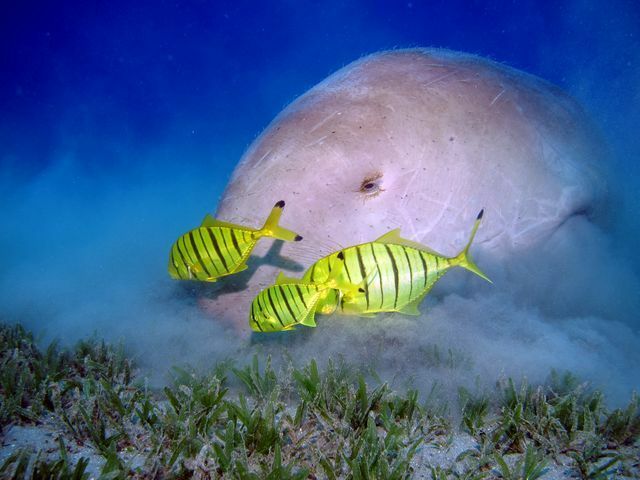 There is evidence that male dugongs lose fertility at older ages. Despite the longevity of the dugong, which may live for 50 years or more, females give birth only a few times during their life, and invest considerable parental care in their young. The time between births is unclear, with estimates ranging from 2.4 to 7 years. Mating behaviour varies between populations located in different areas. In some populations, males will establish a territory which females in heat will visit. In these areas a male will try to impress the females while defending the area from other males, a practice known as lekking. In other areas many males will attempt to mate with the same female, sometimes inflicting injuries to the female or each other. During this the female will have copulated with multiple males, who will have fought to mount her from below. This greatly increases the chances of conception. Females give birth after a 13–15 month gestation, usually to just one calf. Birth occurs in very shallow water, with occasions known where the mothers were almost on the shore. As soon as the young is born the mother pushes it to the surface to take a breath. Newborns are already 1.2 metres (4 ft) long and weigh around 30 kilograms (66 lb). Once born, they stay close to their mothers, possibly to make swimming easier. The calf nurses for 14–18 months, although it begins to eat seagrasses soon after birth. A calf will only leave its mother once it has matured.